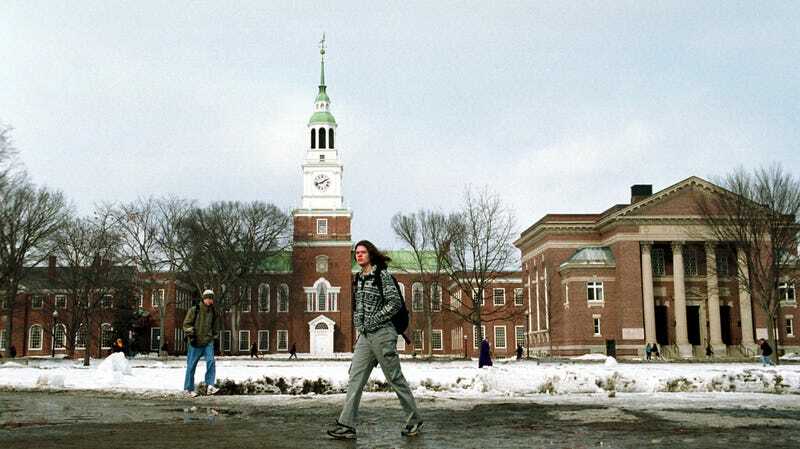 Seven women have filed a class action lawsuit against Dartmouth College, accusing three former professors of sexual harassment and assault, as well as creating a hostile work environment for students. They are suing for at least $70 million in damages. The plaintiffs, one of whom identified as Jane Doe, are suing on behalf of every woman who has been enrolled in the university’s Department of Psychological and Brain Sciences since March 31, 2015. The suit argues at Todd Heatherton, William Kelley, and Paul Whalen “perpetuated an alcohol-saturated ‘party culture’” within the department and turned it into a “21st Century Animal house,” according to the Concord Monitor. It also alleges that the university was aware of the professors’ behavior and did not do anything about it for more than 16 years. The plaintiffs say that the university said they would be included in an independent investigation into the professors’ actions earlier this year, but that they were “ultimately ignored,” according to the Monitor. Earlier this year, the three professors all resigned or retired, rather than be fired. The Monitor adds that “a group of female students” reached out to the Dartmouth’s Title IX office about “instances of sexual harassment and assault by the professors” in April 2017. The suit states that, 20 days later, Whalen allegedly sexually assaulted a graduate teaching assistant.